Yes! Finally your time has come to travel. It doesn’t matter where you are going, you should definitely not forget some very important things. 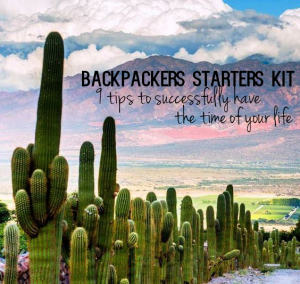 The backpackers starters kit gives you all the tips you need to make a successful travel, no matter where you are going! You finally saved all the money you need to travel and have the best time of your life. Of course you want to cherish these moments, that’s why buying a good camera of GoPro is a well spend present for yourself. Tip: never show a camera of GoPro at a place where you don’t feel yourself save. Always put it in a bag and never carry it with you in a typical camera cover. Sometimes it’s difficult to obtain medicines in a country abroad. If you know what kind of diseases are typical for that part of the world, bring the antibiotics as a prevention with you. So you know for sure that it is the right kind of medicine and the instructions are in your language. Besides that is an insurance card really important, so you don’t have extra money and the procedure will be a lot easier. For the real adventures it is smart to buy yourself a bum bag. You can easily transport your valuables as your phone and passport. Just in case you get robbed, it is harder to spot this. Besides that it is also easy to bring it to a club, or for example to a football match. Important one of the backpackers starters kit: with the app Maps.Me you can easily move yourself to every place you want, without needing any kind of internet connection. The apps works with satellites, what gives you the opportunity to download a map of a city (attention: you need internet for this) before. Once you have downloaded this, it is possible to use the navigation without the use of internet. A lot of backpackers use this! You should really get yourself a creditcard. A lot of hostels all over the world require you the make a payment before you arrive by creditcard. Besides that you should check your card if it is possible to make payments outside your country of continent. A lot of banks only allow you to make a payment inside your own country of continent as a form of safety. You can easily change this by going to your bank. A lot of times you need to show your passport or insurance. In most cases they take pleasure by only showing a copy of one of these. If this is the case, don’t make it yourself difficult and just only bring a copy. For instance in a lot of clubs you only have to show a copy. Hostels offer you a cheap possibility to stay for the night and to meet a lot of travellers. This also means that you are sharing your room with other travellers. Hostels will provide you with a locker, but you always have to bring your own lock. Take some language classes abroad! For example in South-America there are only a few people that speak English. You can take a backpackers’ crash course at Elebaires what not only provides you with a lot useful Spanish language skills but also with a lot of cultural information! Besides that it is a great way to meet other travellers! Well, I think this is the most important one of the Backpackers starters kit.. Enjoy! Probably these opportunities won’t come any time soon again, so you should enjoy it to the fullest!